Nutrient-rich beets and parsnips stand in for potatoes in these colorful latkes. If you have a food processor, set it up with the grating disc to make short work of this recipe. Top off the cakes with a dollop of caraway-spiced yogurt and a few flakes of smoked salmon. Preheat the oven to 250°F (120°C). Spread the beets, parsnip, and onion on a clean dish towel. Gather up the ends and twist the veggies into a tight bundle, squeezing to remove any excess moisture. Place the vegetables in a large bowl. Add the eggs, dill, and ½ teaspoon salt and stir to combine. Sprinkle the flour over the top and fold gently with a rubber spatula. Set aside and let rest for 10 minutes. To make the caraway yogurt, in a bowl, stir together the yogurt, caraway, ¼ teaspoon salt, and ¼ teaspoon pepper. Cover and refrigerate until ready to serve. In a large nonstick pan over medium heat, warm 1 tablespoon of the olive oil. Working in batches, add heaping ¼ cup (2 fl oz/60 ml) portions of the batter to the pan, and flatten slightly with a spatula. Cook until crisp and golden brown, flipping once, 3 minutes per side. Reduce the heat if the latkes begin to brown too quickly, and swirl the pan occasionally to make sure the oil creeps under all of the latkes. Transfer the cooked latkes to a baking sheet and keep warm in the oven. Repeat with remaining batter, adding the remaining oil to the pan as needed between batches. Transfer the latkes to serving platter, with the caraway yogurt and smoked salmon on the side. 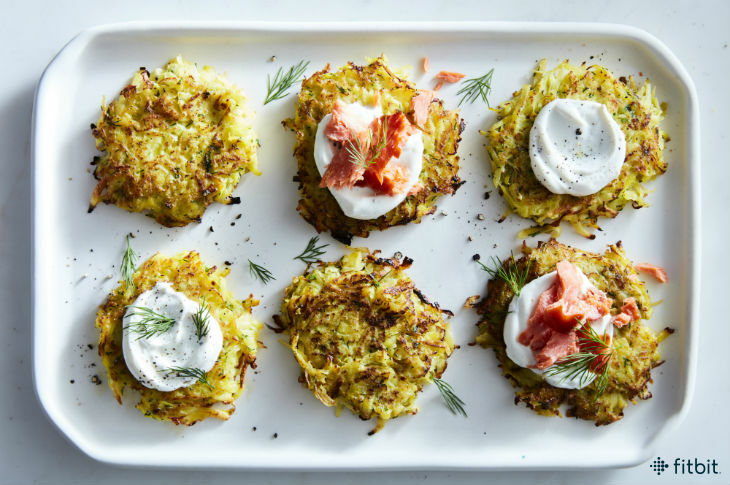 Serve warm, encouraging guests to top latkes with a dollop of yogurt and a few flakes of salmon.